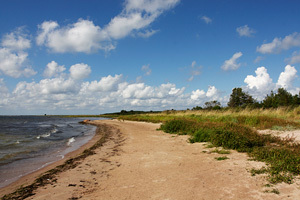 The Loode tourism farm in Kuralase village is located on the Tagamõisa peninsula, West-Saaremaa. Here you can enjoy the silence of an extraordinarily peaceful place. In the farm with the soul of the 19th century, one is surrounded only by the voices of domestic as well wild animals and birds. You can indulge yourself either in a Finnish or in an authentic Saaremaa smoke sauna, and sleep in the thatched log-houses, the oldest of which was built in 1779. It is possible to smoke fish and to enjoy a campfire with an accordion accompaniment or to enjoy horseback ride with your children in the neighboring village. The area is rich of herbs and orchidaceouses. The Vilsandi island "state of birds" lies only half an hour boat trip away, or you can walk there through the sea and isles. The beautiful and rich scenery with a variable coastline invites You to spend Your holidays here. The spring water, the pure farm food and the archaic environment of the surroundings will surely have a soothing effect on You and Your family. Lodging is in the historical log cabins, 14(+2) people and in the main building. In all, there are 8 rooms and 27 beds. In the main building there is a fireplace. Busses from Kuressaare to Tagamõisa: 6.30; 13.15; 17.40. From Tagamõisa to Kuralase village Loode farm 3,5 km.